There’s décor I like, and then there’s décor I can’t. stop. thinking. about. Every week I showcase an item that the team and I are currently obsessing over, aka a “Funk favorite.” The Briallen Demi-Lune courts an elegantly upscale vibe with its decadent wood staining and harmonizing textures. Greet guests in style: this brass-accented console works magic when paired with a choice decorative mirror. The demi-lune (“half moon”) table is founded on beautiful, efficient woodworking. Its flat, wall-hugging back enables the piece to shine even in narrow hallways and foyers while conserving that all-important space. While the table was popularized during 17th century France, the demi-lune’s concept also shares roots with Roman semicircular design. Tapered legs, gilded embellishments, and tripod mountings are typical of this style. Currey & Company, the Atlanta-based firm behind the work, specializes in timelessly fresh design. The Briallen Demi-Lune, like many of their products, exudes a stark Art Deco vibrancy while bringing the design into the modern age. 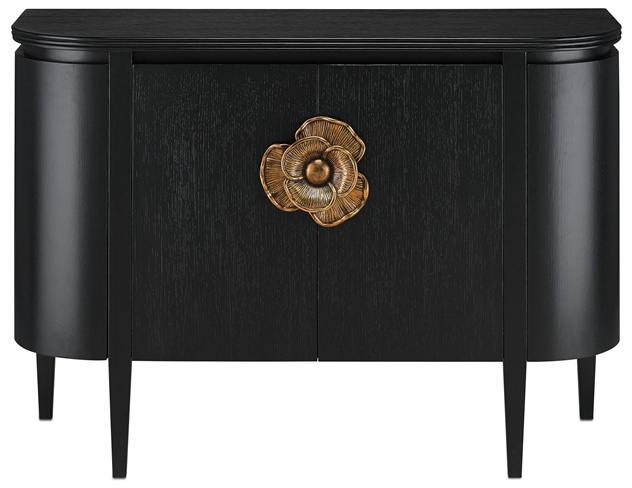 Its exterior is stained with a rich ebony shade, while the front bears an eye-catching brass flower pull. Textured accent panels add masterful details to the table: we love how the vertical grain intersects with the radial inset of the brass.